Where Will You Be on March 10, 1933? Eminent geologist Dr. Robert T. Hill has stated unequivocally that Southern California is in no danger from earthquakes. In his keynote address to the Building Owners and Managers’ Association, Dr. Hill told the group that “there is not a thread of evidence on which to hang a prophecy of an earthquake in this district”. He went on to say that “our occasional little earth tremors merely give me a little thrill in the day time or rock me sounder to sleep at night”. Dr. Hill’s assertion that the Los Angeles area is seismically stable was music to the ears of association members who have been vigorously protesting recent insurance rate increases. The geologist characterized the insurance carriers as “alarmist”. 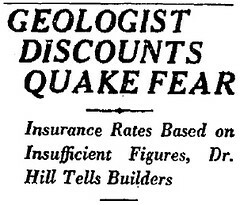 Well, Dr. Hill, dial ahead six years and set your “alarmist” for 5:55 pm on March 10, 1933 when a sizeable earthquake will devastate sections of Long Beach and kill 115 people. 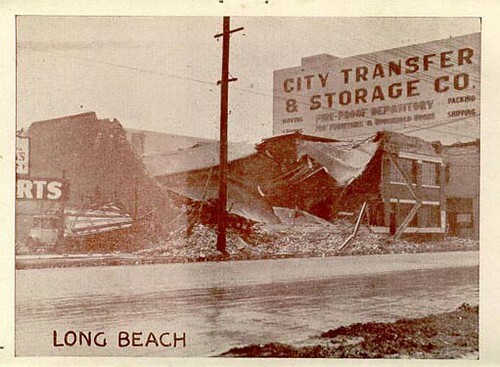 Dr. Hill was conspicuously absent from local newspapers following the Long Beach quake – not even a “no comment”. We hope he wasn’t spending time in this building – whatever it was.